What's the best part of being a Jedi Knight? Is it the ability to command mystical, cosmic energy with your mind? Or having such intense self control over your own body that you could run faster and jump higher than anyone else, and recover from seemingly incredible injuries just by meditating for a bit? Is it the easy-to-coordinate wardrobe of baggy cream colored outfits, brown cloaks, and shaggy hairdos? Those are all swell, but you already know that the real answer is one word: lightsabers! And no Jedi costume is complete without this official Star Wars Jedi Lightsaber Accessory. 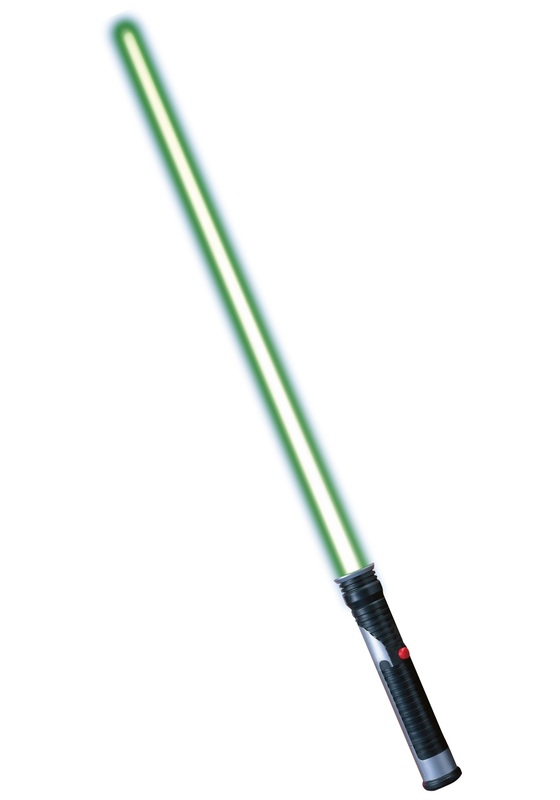 Instead of an unstoppable arc of plasma, this green blade is made of much safer plastic (what, you thought we had real lightsabers, and also that we wouldn't just keep them all for ourselves? ), which lights up with batteries kept in the grip, and also collapses into the hilt. You have to provide your own buzzing and whirring sound effects, though. Junk!! Didn’t last 2 mins. Purchased for a Halloween costume accessory. My 7 year old played swords for a few minutes and the plastic was dented and wouldn't retract back it. IT IS A PIECE OF JUNK. Before he played with it it wouldn't slide back in. If you want to use it for looks but not actually play with it great! It looks like MEGA cheap plastic. Enjoy!